This cover comes with two unboxed two-line cachets in black: SAVED FROM WRECK / OF TARARUA”. The steamer Tararua belonged to the Union Steamship Company of New Zealand. Having left Dunedin on 28 April 1881 with this cover posted on 27 April at Oamaru, addressed to Geelong, the ship headed for Melbourne with some 100 passengers on board. She ran at full speed onto the rocks of the Waipapa Reef on route to Bluff at the southern tip of New Zealand’s South Island. In all only 20 survived the wreck with 131 souls losing their lives. Divers were sent down to save some of the cargo including some of the mail bags. Only some 9 mail items are known to have survived. 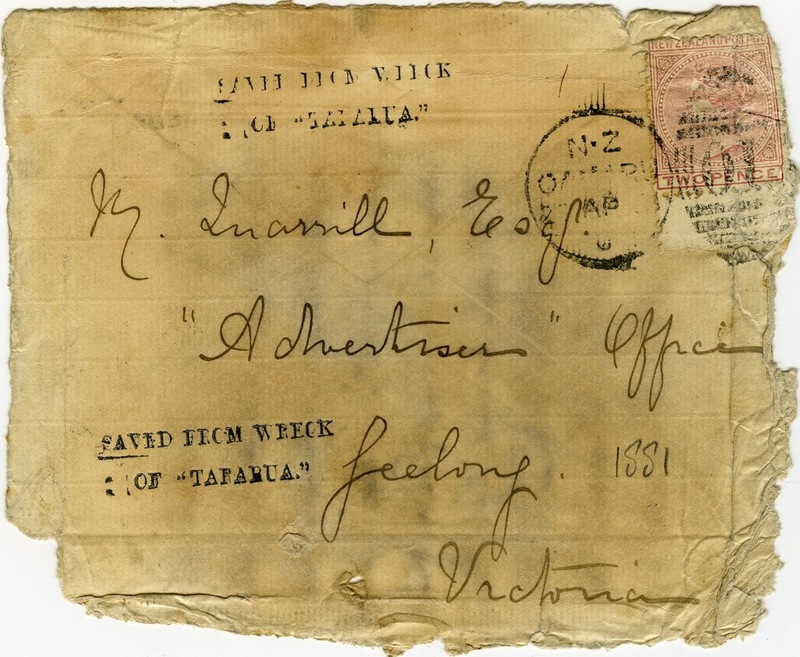 Two types of cachet were applied in New Zealand to the salvaged mail. .